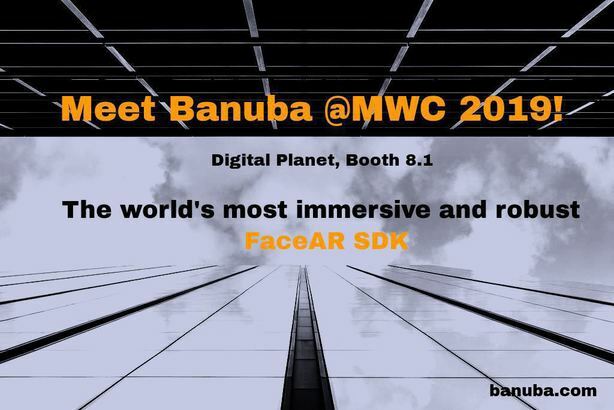 Visit Banuba at Mobile World Congress 2019 in Barcelona! Once a year Barcelona turns to an enormous machine. It rolls the wheel of innovation, progress and technology breakthroughs. We can’t but miss the world’s #1 tech even and show what Banuba has to put on the table. Our team is happy to attend the show from February 25-28th 2019. We welcome you to visit our Booth 8.1J9, Digital Planet pavilion, to discuss the latest and greatest in augmented reality, computer vision and camera technologies. Or just for saying ‘Hi’ and a cup of coffee. We’ve prepared a couple of demo topics for you! Don’t find the right one, need tech consultancy or just folks to hang out? Drop us a line! Our face filter technology can beat even Snapchat in render and trigger capabilities allowing brands and developers to create literally any kind of AR camera experience. Fun & crazy. Gamified & ultimately immersive. Super realistic or absolutely fantastic. Come and try them all and get your dose of inspiration and laughter. Virtual makeups are trending, and we’ve got some amazing beautification features to show. Full-face makeup or one based on face segmentation. Skin and hair color detection. Face morphing and hair recoloring. These are just a couple of examples what our beautification technology can do. Visit us to learn all or discuss custom beauty feature development for your mobile app. Apart from common age, gender and ethnicity detection that all computer vision companies do, we’ve got something special for you. Visit us to get your heart rate measured fully remotely by just using a mobile camera without any contact with the device. Or see your gaze tracking in real time. This is just the glimpse. More fun on the spot!